If the closest you’ve come to a huge diamond is when you press the “enlarge” button on the Tiffany website and it turns out that you’re looking at a 1-carat diamond ring, then it’s time to further your gemstone education at the Treasures from India: Jewels from the Al-Thani Collection exhibition at The Metropolitan Museum of Art. The carat or weight of a diamond is measured in grams and it is 0.20 grams. It is rare to see a diamond that is over 10 carats. Reportedly Jay-Z gave Beyonce an 18-carat diamond ring valued at $5 million when they were married. Most mega-celebrities sport around 5–15 carats when they nonchalantly caress their bangs in front of trigger-happy paparazzi. So in this diamond-infatuated society it is hard to ignore the elephant in the exhibition when you come face to face with a 57.31-carat monster labeled “Star of Golconda” Diamond and Brooch by Cartier. Although the name alludes to the region in India where the rarest and purest of all diamonds in the world were found, it seems this gem could be from either India or Africa. Unfortunately, perhaps due to its size, the “Star of Golconda” is not as scintillating in its brilliance as one would expect a diamond to be. The brightest and most mesmerizing piece in the exhibition has no less than 17 smoky yellow diamonds, each one about the size of a nickel set against a fan of pure white feathers. Their intense sparkle pierces the dimly lit space of gallery and draws you in like a magnet. Where would one wear such a creation? It is the Turban Ornament (jigha) of the Maharaja of Nawanagar, so one would need a throne, in a large and lavish room with attendants, music, and a feast—a palace type setting. The exhibition has some 60 jeweled objects from the private collection of Sheikh Hamad bin Abdullah Al-Thani among which, quite a few, are turban ornaments. “The jeweled arts of India have fascinated me from an early age, and I have been fortunate to be able to assemble a meaningful collection that spans from the Mughal period to the present day. I am delighted that The Metropolitan Museum of Art will be exhibiting highlights from the collection, making the subject known to a wider audience,” stated Sheikh Hamad in the press release. The pieces on display show the evolving styles of jeweled arts in India during the Mughal period in the 17th century and various courts and centers of the 18th and 19th centuries, including the Hyderabad period. There is also a group of late 19th- and 20th-century jewels made for India’s maharajas by Cartier and other Western firms. India’s Mughal rulers and their successors had ceremonial and functional objects made of luxury materials that included precious gemstones, precious metals, pearls, and jade as well. Among the Mughal works is a jade dagger dating from circa 1620 that was owned by two emperors. The hilt that features a miniature sculpture of a European-style head was made for Jahangir, and it was re-bladed for his son Shah Jahan, builder of the Taj Mahal. By the 19th century, the dagger made its way into the collection of Samuel F. B. Morse, inventor of the Morse code. Overall, the exhibition demonstrates the lavish and exuberant style of Indian jewelry that continues to capture the imaginations of the world’s prominent jewelry designers. A few exquisite Cartier brooches also on display pay homage to the style featuring huge emeralds sculpted in relief with floral motifs. 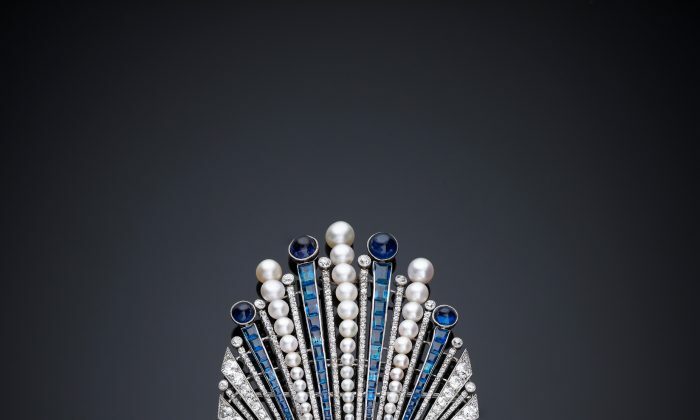 And a work designed by the artist Paul Iribe and made by goldsmith Robert Linzeler in 1910 in Paris is inspired by the kind of aigrette (decorative pin) that would have ornamented the turban of a Maharaja or Nizam. At the center is a large emerald, carved in India between 1850 and 1900. A most unusual piece in the exhibition is the meekly named Plait Ornament (jadanagam) dated 1890–1910 from South India. The over 12-inch-long and nearly 3-inch-wide masterpiece resembles a flowing garland of silver leaves set with diamonds and flower-bud-like pearls and rubies. It is clear that the unnamed Indian designer who created it was very much influenced by European jewelry design as the piece recalls the French Rococo style of the 1700s. But the most intricate and grand piece in the display has to be Jeweled Crown from Nepal dated 1900. It is essentially a hat made of hundreds of seed pearls with gold brocade, diamonds, emeralds, rubies, and the bird of paradise plumes that arch over toward the back—a display of wealth, power, and show-stopping beauty that must look even more dramatic when worn by the actual ruler of the land himself. Undoubtedly, it is amazing to see such exquisite jewelry on display, but even more amazing is the fact that they are in the collection of one person who is unlikely to use them as intended. However, the days when courtiers would congregate around the Maharajah clad in all the regalia and jewelry that one could pin to the already highly ornate clothes are gone. It harkens back to another time, when time was not measured by the “New York minute” and when you would never bump into Indian royalty who is studying IT in jeans and a T-shirt. It is lamentable that the time when these jewels would have really come to life is truly gone, for the premise of every piece of jewelry is that it is made to be worn. It seems that the destiny of these pieces is to beacon to their admirers from behind glass and high-tech surveillance systems—a rather anticlimactic fate for such brilliant creations. Treasures from India: Jewels from the Al-Thani Collection is on view until Jan. 25, 2015.